This week’s conversation is about one of our very favorite things: wine. Indeed, what goes better with a good book than a goblet of vino? So, what took you so long? you might ask. We’d answer that we were waiting for just the right book—and John Briscoe’s Crush, from the University of Nevada Press, is unlike any wine book we’ve ever seen. It’s not pretentious. It’s not written as if we first tasted wine last week. It’s not an encyclopedic list of every grape variety ever discovered. No, Crush is fantastic history, written by a poet (seriously, John is a published poet—check out our review of his The Lost Poems of Cangjie), about the greatest of all New World wine regions. 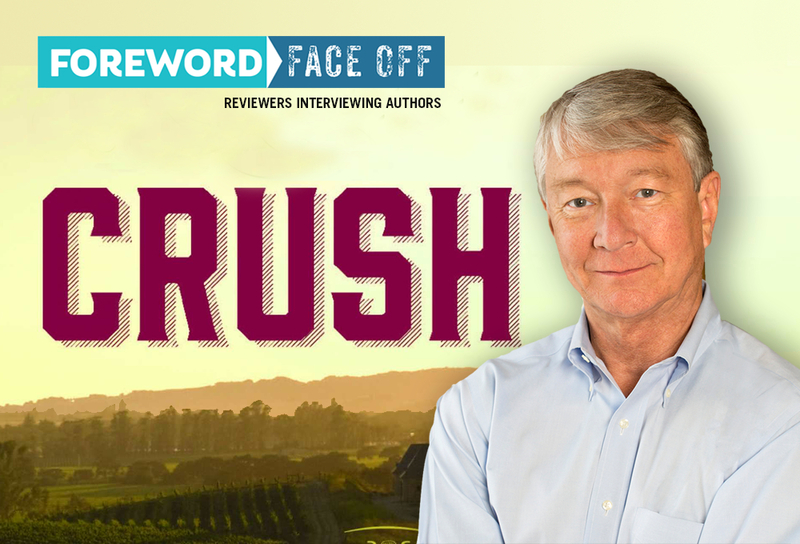 We asked Rachel Jagareski to write the review of Crush for our University Press special section, and her enthusiasm was all we needed to set her up with John for a Foreword Face Off. You’ll find Special Features and Featured Reviews at the end. Congratulations on putting together such a chewy, vivacious history of California wines. So many wine books are as off-putting and dry as a hundred-year-old cork, but your narration was absorbing, while also exhibiting a tremendous amount of scholarship. The extensive footnotes and bibliography indicate that you spent a good chunk of time researching and writing this book. Can you expound on the impetus for this project and how long it took from start to finish? The impetus for Crush were several (I think the plural of impetus, in Latin, is impetus). History fascinates me—“big history,” world history, local history. Sixteen years ago I published a history of San Francisco’s astonishing ascendance to acclaim as the second-greatest restaurant city in the world, after Paris. (The book is Tadich Grill: The Story of San Francisco’s Oldest Restaurant, published by Ten Speed Press in 2002.) That recognition came in fewer than twenty years from the city’s true founding in 1849. During the research and writing of that book, I conceived of this history of wine in California. The story of California wine stands stark in contrast with the story of San Francisco’s swift rise in the realm of cuisine; for it took more than 200 years for California winemakers to realize the dreams of its earliest winemakers that the state could be among the best, if not the best, wine region in the world. The many calamities and comebacks that preceded the glory of 1976 seemed a story worth telling. The book took at least the sixteen years I mentioned; I have several day jobs that seemed ever determined to interrupt my passion to write. (Among those day jobs: I practice law, here and abroad, am a “distinguished fellow”—whatever that means—at the University of California, Berkeley, and am co-owner of Sam’s Grill in San Francisco, the fifth-oldest restaurant in America.) My principal writing passion is poetry. (The review that Foreword Reviews gave of my last book, The Lost Poems of Cangjie, is deeply gratifying.) Another impetus for Crush was the delightful diversion it gave me from the somber work of the consequences of war, and the sweet and sweaty, gritty labor of poetry. Of all the disasters which decimated the California wine industry, none were of such biblical scope as the 1906 San Francisco earthquake and fires. Your passages about this disaster are full of horrible, vivid imagery and effectively use primary sources to relay the scope of the devastation. Amidst the horror and tragedy of your earthquake chapter, however, the image that stayed with me was of San Francisco firefighters helping to pump out a warehouse basement full of smoky, splintery wine into offshore grain barges to be salvaged into brandy. How was this diversion of essential public emergency services not considered a public scandal in its day? In San Francisco then, as now, not to have diverted those essential public-emergency services to the noble cause of salvaging that smoky, splintery wine would have been the monumental public scandal. I’m tempted to quote Steve Allen and write, “All seriousness aside … “ Well, I guess I have, but in all seriousness, the earthquake and the four days of fire it caused that destroyed nearly all of the city exposed, literally, much bigger scandals. For one, City Hall collapsed in the quake, exposing to all who walked by its criminally inadequate foundations and columns—which is to say exposed just how on the take the city’s building inspectors had been to sign off on such shoddy construction. Of course, those building inspectors were just the bottom rung of the un-Jacobian ladder of bribery. The mayor and all members of the city’s board of supervisors were soon indicted on graft and corruption charges, and their names repose in infamy. Those firefighters, though, who salvaged the wine of the California Wine Association, have been ever after remembered fondly as civic heroes. 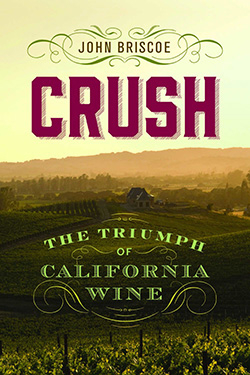 Crush contains scores of detailed sketches of vintners, winemakers, agronomists, tycoons, and wine lovers involved in the history of California wine. Which hero in this saga is most deserving of a bottle of 1973 Stag’s Leap Wine Cellars Cabernet Sauvignon? (One of the vintages that put California wines on the world stage after the Paris tasting, described in Crush.) Conversely, which villain deserves to be marinated in a vat of adulterated plonk? Robert Mondavi is, or would be were he living, most deserving of a bottle of 1973 Stag’s Leap. He was not the first visionary winemaker in California, but he was the one who saw his vision through, though tragically he was not in Paris to see the realization of his dream. He was in a makeshift courtroom in Napa at that moment, suing his mother and brother for firing him from Charles Krug. More tragically, his mother Rosa, whom Robert was suing and whom he visited every morning of the trial, praying at her bedside, died July 4, 1976, Bicentennial Day, in the middle of the epic three-month trial. After Rosa’s death, the trial continued on. There are many villains, but perhaps the most villainous was the murderous Leland Stanford (yes, he of the Junior University), who funded hunting parties to kill native Californians. And did they kill. Benjamin Madley’s An American Genocide is a book that should be read by all Americans. Stanford secured vast tracts of land along the upper Sacramento River, in part by financing the massacre of the land’s rightful owners, and planted there the world’s largest vineyard. (All those “Robber Barons” were trying in one way or another to out-Ozymandias each other.) But alack and alas, the land was too hot, the grape juice good only for brandy, Stanford’s deluvial brandy production flooded the world market, and the whole enterprise foundered. Fabulously. So, is there a God? Of all the amazing wines discussed in your book—from the sacramental wines produced by the 18th century Spanish missions, to the award-winning California wines at the pivotal 1973 Paris tasting, to the contemporary “cult wines” endorsed by various wine critics—which would you most like to drink right now and why? The palate given me is too dull for fine wines. I would add “alas,” but perhaps because of my poor palate, I am less poor; I don’t crave crazily priced wines. I am the dullard who can say only that I like or I don’t like a particular wine. Still, I would like to taste one of the legendary Inglenook vintages from the post-Prohibition days, before that great winery was bought, just for the monetary value of its name, from the cash-strapped descendants of its founder Gustave Niebaum. The thimbleful I would accept (for me to accept any more would be a crime against a World Heritage Wine, if there is such a thing) would be wasted on me, but I would accept it, with fierce feigned objection. Crush contains so many intriguing and beautiful historic illustrations. What were some of your best sources for these images? The historical wineries themselves, and more current ones like Harlan Estate, were generous in giving their permissions for images. But The Bancroft Library at the University of California, Berkeley, was especially generous. Director Emeritus Charles Faulhaber and Assistant Director Peter Hanff were of enormous help throughout. The 2017 wildfires took a heavy toll on the Napa Valley and other winemaking counties and the 2018 wildfire season also threatens more vineyard acres even as this interview goes to press. With increasingly erratic weather patterns driven by climate change, are you worried about yet another cataclysm ahead for the California wine industry? And if not wildfires, what do you see as the most worrisome threat to California wine today? Fires and the global climate change that caused, or contributed to last fall’s fires in Napa and Sonoma counties are not my main fear, though a hundred years hence, if we are to survive that long, they might be the main fear of the California wine industry. The most worrisome threat to California wine is the most worrisome threat to the planet. That is annihilation of life on earth, human-sustaining life, by nuclear war. The war’s greater tragedy may be it’s averting our eyes from the ultimate, incomprehensible horror, what in 1963 was so speakable, but is not now. Then, all America was consumed with anxiety about nuclear war. Then we had the capacity to destroy the planet with nuclear weapons. Today we have a thousand times that capacity. Why are we not a thousand times as worried as we were then? The Vietnam War, I suspect, gave us something manageable, “handleable” to obsess over in place of the terrifying scenario of the film On the Beach—Armageddon in our time. Following the Gulf War of 1990-1991, I served several years as a Special Advisor to the United Nations on the environmental consequences of war. I still awaken every morning wondering why we are. Why we are alive, I mean—and too, why we are not as angst-wracked a nation as we were in 1963. Can it be because California produces such good wines? Sick humor is sometimes all one has to brace against the awful. (Was it Kingsley Amis who said, “Laughing at sick jokes is the liberal’s way of misbehaving”?) And yes, the true tragedy of Vietnam will be the subject of one of my future books, God willing, and the seas don’t rise, too much.